Summary: SketchList 3D uses the containers as collections of objects and other containers that make up the overall design. The project is the highest level container. It is the thing you are making: kitchen, office, entertainment center, or even an entire room. A project must have at least one assembly although there is no practical limit to the number of assemblies that might be in a project. An assembly can contain three types of containers – in a way they really are specific sub-assemblies. These are door, drawer, and hardware. Sub-assemblies cannot exist directly in a project and also must exist within an assembly. A board is not a container but may exist in an assembly, a door, drawer, or and hardware. A board cannot exist directly in a project but must occur within an assembly. Create, size, and locate the different types of container. Navigate from one level of container to others. Work with containers to achieve efficiency in your designs. Use the tools available in SketchList 3D to maximum flexibility. Doors and drawers in the assembly. SketchList 3D running on your computer. Blog post describing how to use tools and forms to achieve your design objectives. Activities Open SketchList 3D and create a project. Insert a number of assemblies and size them. Locate assemblies in relationship to each other. Insert doors, drawers, hardware and boards into assemblies. Fill doors, drawers, and hardware with boards. A container is any three-dimensional space in your design. Project contains only assemblies. There must be one. There is no practical limit to the number of assemblies you can place in a project. Assemblies are groups of containers and objects that form your design. 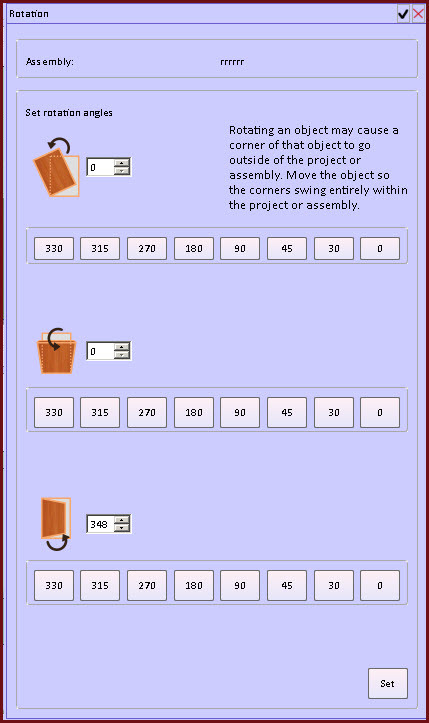 The advantage of using an assembly is if you move the location of an assembly and a project all of its contents move at once. Another advantage of using an assembly is you can build one unit – for example a bookcase – and make a clone of that assembly and place it in another location. You might place that assembly exactly as is, or you might change some aspect of the design. For example you might add doors or drawers. You can even change the size of the assembly. Assemblies have three dimensions: height, width, and depth. A new assembly is inserted into the project and the size of the assembly defaults to be equal to the project size. When you insert the assembly you will see green outline of a box that shows the outer limits of the assembly. An assembly cannot exceed the limits of the project. If you attempt to do that you’ll receive an error message. The assembly is given a default name when created in SketchList 3D. It is good practice to replace that default name with a name that describes the assembly in a meaningful way. Assemblies may be saved as standards. The collection of the standards forms your library of pre-existing design pieces. Once created, the standards can easily be inserted into new projects. Doors, drawers, hardware are essentially sub-assemblies. They can be inserted into an assembly. New containers are inserted as empty boxes. You can drag boards into the container to ‘build’ your design. 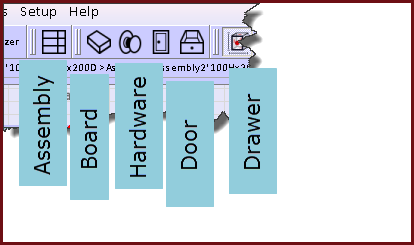 Like with the assembly the advantage is when you design a door, drawer, or a piece of hardware all of the parts of that can be moved around in the assembly at one time. Other advantages are the same as the assembly. These sub-assemblies can be cloned, moved about, rotated, modified, and adjusted in size. 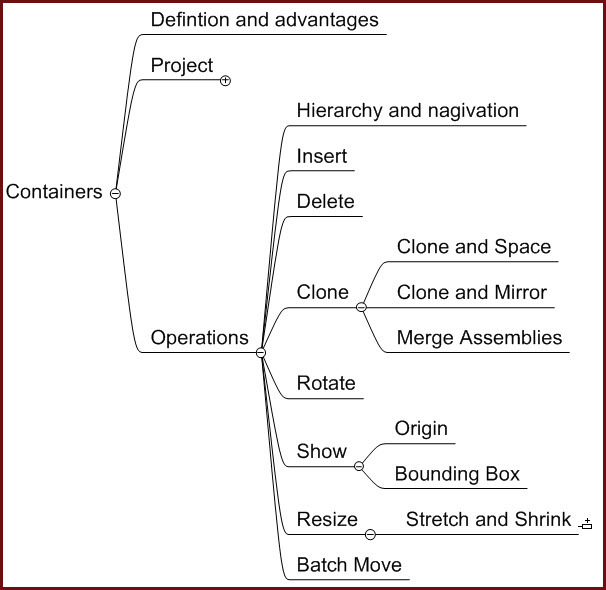 The containers in SketchList 3-D exist as a hierarchy. You must be in the proper level of container to design in that container. 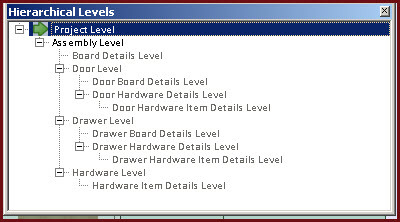 For example you want to put a board in a door, you must select that door and drop into the door level. Often if you double-click on the object you want to work with SketchList will put you at the proper level. Sometimes SketchList may open the form show possible containers in which to work. Pick the one you want. Another way to get to proper level is use the hierarchy form. Just click the level at which you must work. Insert an object or container into your design by clicking the icon the top of the screen and dragging that icon into your design area. If nothing happens that indicates you are not dropping the container or object in a valid location. For example you cannot drop a board directly onto a project but must drop it into some other level of container. To delete an object or container select it and click the delete button on your keyboard. Alternatively you can right click the object or container and pick delete from the menu list . There are three types of clone in SketchList 3D. The basic clone function and combines copy and paste. A clone is an exact copy. This includes the location and size of the object being cloned. The result of this is there’s no visual clue in the image area that the clone has been made. However if you look at the spreadsheet you’ll see that the role of the newly cloned object has a background color of yellow. When any changes made to the object that background yellow hint goes away. 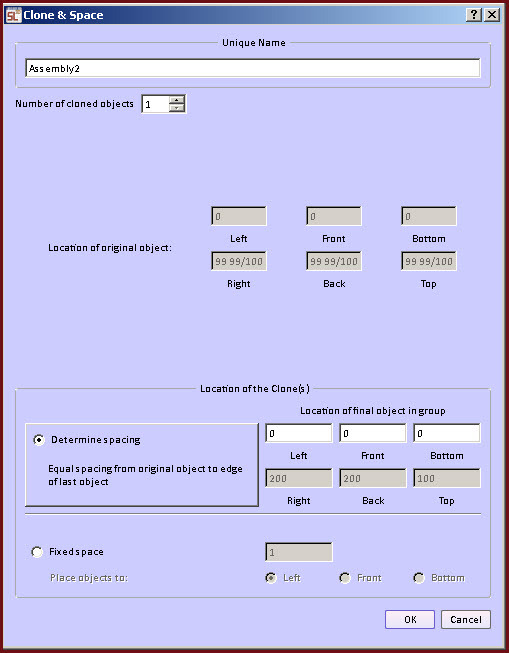 If you select an object or container and click the clone button on the form, or right-click in the spreadsheet and click clone on the list, or right-click on the object in the image area and right-click on the menu that opens. Clone and space. Clone and space function will make any number of copies of the selected object or container and space them. The spacing can be a specific distance apart. Alternatively SketchList 3D can calculate the necessary distance between two points and space the desired number of objects equally on that span. Watch the video for a detailed explanation do this. Clone and mirror. 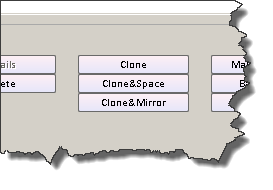 Clone and mirror makes a copy of the selected object or container flipping it 180° on the horizontal plane. We use this option if you have built for example an assembly with doors on the right and shelves on the left and want to switch the doors and shelves left to right in the resulting cloned assembly. Rotate. All rotation happens from the point of origin (the front equals zero, left equal zero, bottom equals zero, point) in a counterclockwise motion. Also after the rotation is made, the values shown in the triplet remain as they were before the rotation. To better help locate rotated objects and containers it is best to use the blue dot method. This is discussed in detail the lesson on locating boards. There are two ways to rotate an object or container in SketchList 3D. The first way is with the red dots icon clicked [top of screen] hold down the R key on your shift board and select one of the green dots that appear. You can then move your cursor/mouse in a manner to make the rotation you desire. Be aware that SketchList 3D will not allow you to rotate an object such that one of its corners is outside of a container. 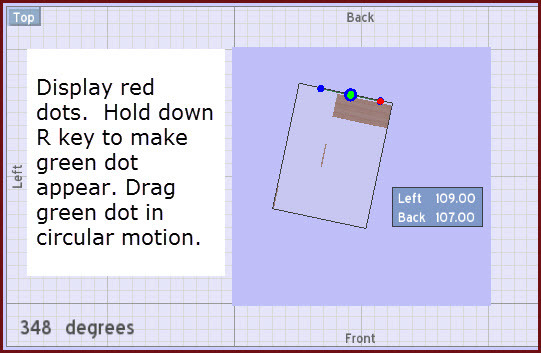 The other way to rotate an object or can is to select it and click the rotation tab near the right side of the screen. When the form opens enter the direction and number of degrees to rotate the object. The number of degrees can be typed in or you can click a button for a “standard” amount of rotation. There are a number of functions in SketchList 3D that aid you in visualizing your design. Show unit box will display the green box defining a container if. Unchecking this hides the container green box. Show floor shows/hides the floor of the project. Wireframe shows the elements of your design as a line drawing. Show title and show hints set up the guides to the image area. You can also turn the grid on or off. You can show the corner points (blue dots), resize points (red dots), the point of as a blue dot and the point of origin as a three directional set of arrows. You can also show or hide any container or object by selecting it and checking or unchecking the check box in the spreadsheet row labeled “Hidden”. Stretching or shrinking an assembly. To stretch or shrink an assembly click the red dot icon at the top of the screen and select the assembly you want to edit. Use your mouse/cursor to select one of the red dots and pull or push it in the direction that you want to change. Alternatively you can right mouse click the red dot and type in the size or distance you desire. Be aware that the red dot method of shrinking and stretching changes (almost) everything in the container proportionately. We are working on a way to have you choose how to shrink or stretch while excluding certain objects. 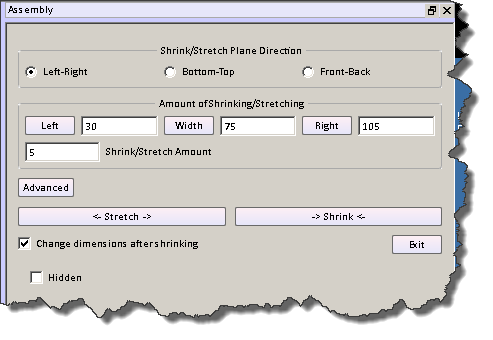 There is a second method that is very precise and detailed for stretching and shrinking assemblies. At the project level pick the assembly that you want to change. 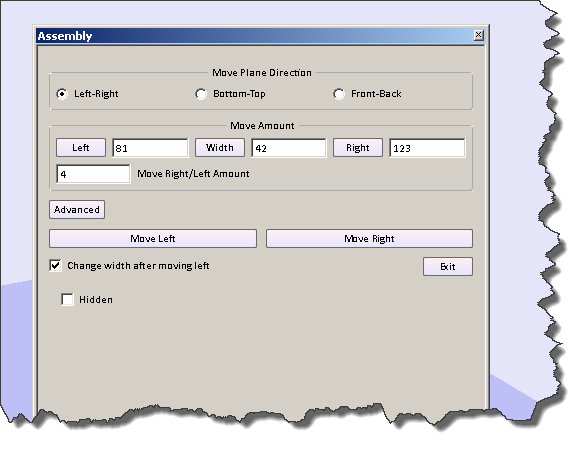 Click the Shrink/Stretch button on the assembly form. When the form opens check the radio button to indicate which direction you would like to apply the shrinking or stretching. At that point you will see the location and size of the assembly in a triplet. You can edit one or two of the values and click the button of the third to have SketchList calculate its value. At this point SketchList will also calculate the amount of the stretch or required to achieve the values in the triplet. Optionally you can enter the shrink or stretch amount. For example if you have a 24 inch wide cabinet and you wanted to become a 36 inch cabinet enter 12 and click stretch when you’re finished you must click the exit button to leave the stretch and shrink mode. 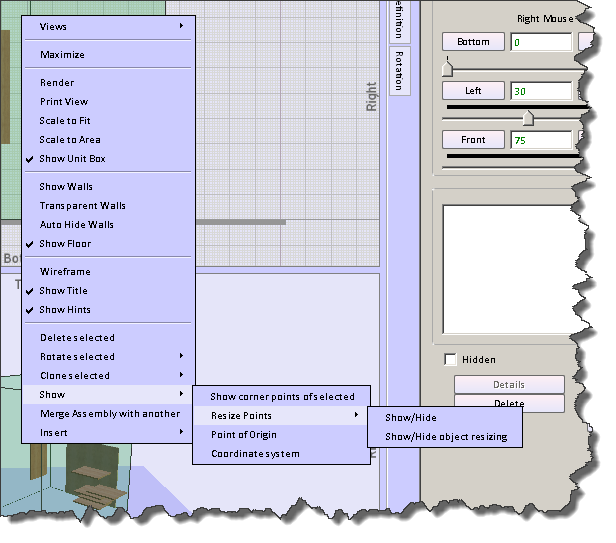 Batch move function in SketchList 3D moves everything in an assembly to the specified direction by the specified amount. If for example you wanted to add 3 inches around the assembly for a molding that is easy enough to do on the right side of the assembly. Just add three to the right side and change the width. But there is no way in SketchList 3D change the side of an assembly that has a value of zero – for example left or front or bottom. In this case you would move every object and container in the assembly one at a time. Batch move saves this work by allowing you to select the direction and enter the amount of the change. This overview of containers in SketchList 3D gives you a basic understanding of how they work to achieve your designs. Become familiar with all of these tools and concepts you should practice using SketchList 3D in a way that includes this information. Make sure you watch the accompanying video.